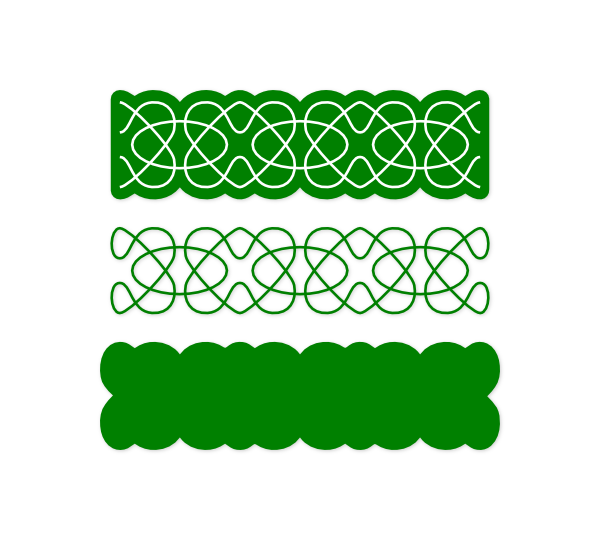 Here are svg files for two single line versions of the rope border here. These are for use with markers or gel pens. 🙂 Just like all open path files, be sure that the file doesn’t touch the cutting boundary or SCAL2 will close the paths by connecting the end points. The download is a zipped folder with two single layer files for use in SCAL2. These files are for personal use only. Feel free to link to this post, but the files are not to be shared or distributed in any way. The download is a zipped folder with a layered svg file for use in SCAL2 and two single layer files for use in either version of SCAL. These files are for personal use only. Feel free to link to this post, but the files are not to be shared or distributed in any way. One of the features of SCAL2 that I like the most is the ability to import layered svg files into SCAL and use the layers as a design element. I don’t remember what brought the idea to mind, but a few days ago I thought how well suited Celtic knots are for a layered svg to do a combination of markers and cutting. I started with a corner I found on clker.com. I connected pieces and welded others to make a file ready for cutting. I used that as the marker layer, then I created the mat behind it for cutting. Cricut markers are 1.5 mm, which is a little large for most images. I used a mini gel pen to draw the knot, then changed which layer was visible and exchanged the pen for the blade holder/blade to cut out the corner. I cut it at 2.5 inches, which was still a little small for the leaf details. This file is a layered svg file for use with SCAL 2.0. This file is for personal use only. Feel free to link to this post, but the file is not to be shared or distributed in any way. One of the great new features of SCAL 2.0 is that you can import layered svg files into SCAL and use the layers as they are, or use the ungroup feature to separate the svg layers and move them around. You can get SCAL 2.0 here as either a new program or an upgrade. I used Inkscape to create a card file with three layers, one to score the card for folding, one to use markers, and one to cut the card. I created a separate layer for scoring rather than using dashed lines because you can use an old blade turned upside down in the blade holder to make score lines. Here are the steps I used. Create an svg with a layer for each technique you want to use (ie a cutting layer, a scoring layer, a layer for each color of marker, etc). Leave all of the layers that you wish to use in SCAL visible. Import the svg into SCAL. If the layer window in SCAL2 isn’t showing, from the menu, Window/Workspace/Advanced. The layers window should be in the lower right corner. Click on the triangle next to the svg folder to reveal the svg layers. Open and close the eyes to determine what is in that layer, then click on the menu button at the top right corner of the layers box, select “Properties”, then change the name to represent that layer. Do this for each layer. Close all of the eyes, then open them one at a time to use each layer. Here is the card I made. You could also use the marker layer to cut an overlay for the card instead of using a marker. The download includes the svg file, a 2.0 scut for use with a 6×12 mat, and a 2.0 scut for use with an Expression. These files are for personal use only. Feel free to link to this post, but the files are not to be shared or distributed in any way.